A-1 Freeman Moving Group, a family owned and operated company, is the parent company to Paper Pig Shredding and A-1 Freeman Record Management. Paper Pig Shredding is a licensed and bonded company with 4 shred trucks and over 1,200 bins used to collect over 75 tons of recyclables each month. Paper Pig Shredding is proudly NAID AAA certified. 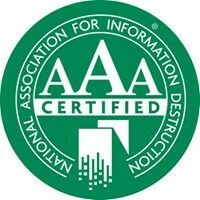 The NAID AAA Certification Program is a voluntary program for NAID member companies providing information destruction services. Through the program, NAID members are audited for mobile and/or plant-based operations in paper or printed media, micromedia, computer hard drive destruction, and/or computer hard drive sanitization. Under this program, the certification application and associated fees cover only individual locations. If a NAID member operates in multiple locations, each location must pass the audit to be certified. NAID members who receive certification must specify the location certified in company literature when referencing the NAID certification program. Paper Pig Shredding is honored to have received a Certificate of Recognition for Recycling Excellence in 2017 for recycling 1,065 TONS of paper. 2019 year-to-date TOTAL is 207.68 tons of paper / cardboard shredded / recycled. 2018 TOTAL was 1,226.59 tons of paper / cardboard shredded / recycled.